More than 2700 years after Isaiah prophesied, God still speaks through him. Isaiah's message of warning and God's coming judgment was unpopular in his day. Yet it was also a message of hope, rich in prophecies about God's promised Deliverer that were to be fulfilled in Jesus Christ. Isaiah issued dire declamations of human sinfulness, and urged his audience to reject their false gods, but he also triumphantly declared: "God saves sinners." Pastor and former Old Testament professor Raymond C. Ortlund Jr has made a worthy contribution to the Preaching the Word series in this commentary on Isaiah. To the clear, thorough exposition that has come to be expected of this series, Ortlund adds his wisdom and forthright expression. A passionate expositional commentary, Isaiah is a valuable resource for pastors, teachers, and personal Bible study. 496 pages, from Good News & Crossway. 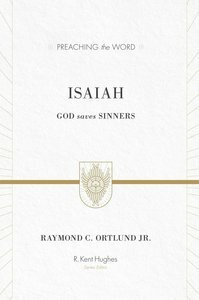 About "Isaiah - God Saves Sinners (Preaching The Word Series)"
Customer Reviews For "Isaiah - God Saves Sinners (Preaching The Word Series)"
I would recommend this commentary to anyone interested in looking indepthly at Isaiah. Particularly if it is being preached on at church or in bible study, it is an excellent book to supplement the teaching given. I am not theologically trained but found this commentary insightful in looking at Isaiah through the eyes of the new covenant. Even if you aren't studying at a theological college I would recommend you suppliment your personal devotions with this book. The eBook was particularly good as I could carry my bible around and whenever I happened to read a chapter of Isaiah I had this on my phone which I could read along with it. Instead of only having it at home. Raymond Ortlund Jnr's faithful exegesis of Isaiah brings God much glory! The Old Testament book of 1 Samuel records the story of three important leaders in Israel's history: Samuel, Saul, and David. The lives of these flawed men showcase God's gracious response to ancient Israel's leadership crisis, offering valuable lessons related to why leaders fail, the impact this failure can have on God's people, and what it means to model godly leadership-even today. In this accessible commentary, John Woodhouse shows how 1 Samuel reveals the importance of true leadership and the character of the godly leader. More significantly, this volume points forward to Jesus Christ, the fulfillment of God's promises to his people and the only perfect leader the world has ever known. A great resource for pastoral ministry and personal Bible study, showing how John's letters lay out the foundational nature of truth and love in the context of the local church, with teachings that overflow with theological depth and real-world wisdom.